The Apple Watch is great and has decent battery life, but sometimes we need to have portable power on-the-go for those days when we’re away from our home chargers. While most Apple Watch chargers are designed for use at home or the office, they also require you to provide your own charging disk. 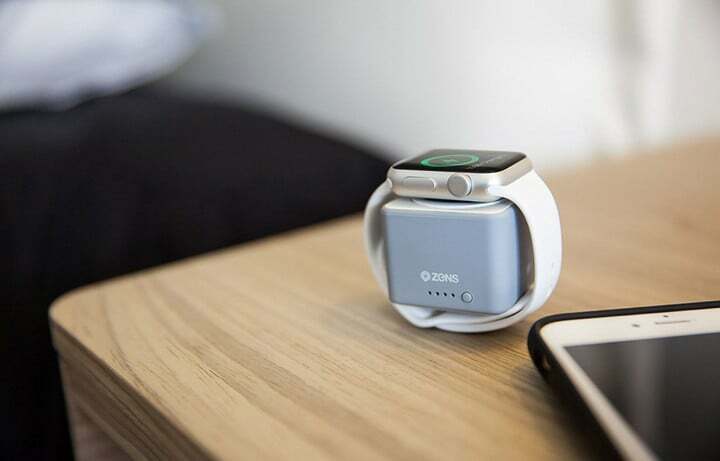 But if you’re looking for a super compact and portable Apple Watch battery bank that doesn’t need extra cables, then look no further than the ZENS Apple Watch Powerbank. 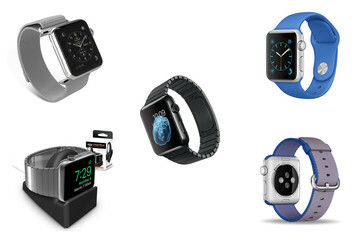 The ZENS Apple Watch Powerbank is a small cube that you can fit anywhere, including your pocket. It’s incredibly small and compact (4x4x3.15 cm and weighs only 68 grams), and features a soft-touch, matte rubber material along the sides and part of the bottom. On the bottom is a clear, hard rubbery material that makes the power bank less prone to sliding around on slick surfaces. At the top of the cube is a slick white plastic material, along with a built-in Apple Watch magnetic charging puck that sits flush with the white plastic. 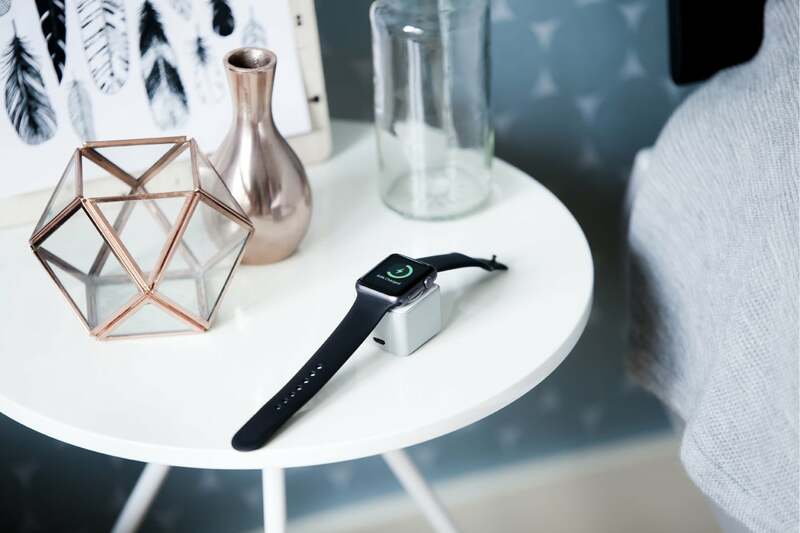 You can just rest your Apple Watch on top of the puck, though it’s recommended to wrap your strap around for a secure fit, especially if you plan to use it in Nightstand Mode. It’s incredibly small and compact, and features a soft-touch, matte rubber material along the sides and part of the bottom. The front of the power bank features the ZENS logo, along with four blue LED lights and a small button to turn the battery on. The back of the cube has a single micro USB port for charging the battery, which has a capacity of 1300 mHa and is is Apple MFi Certified. There are no cables sticking out when you use the power bank, because the battery is built in to the cube itself. When you receive the ZENS Apple Watch Powerbank, it only comes with a white flat micro USB cable for charging. 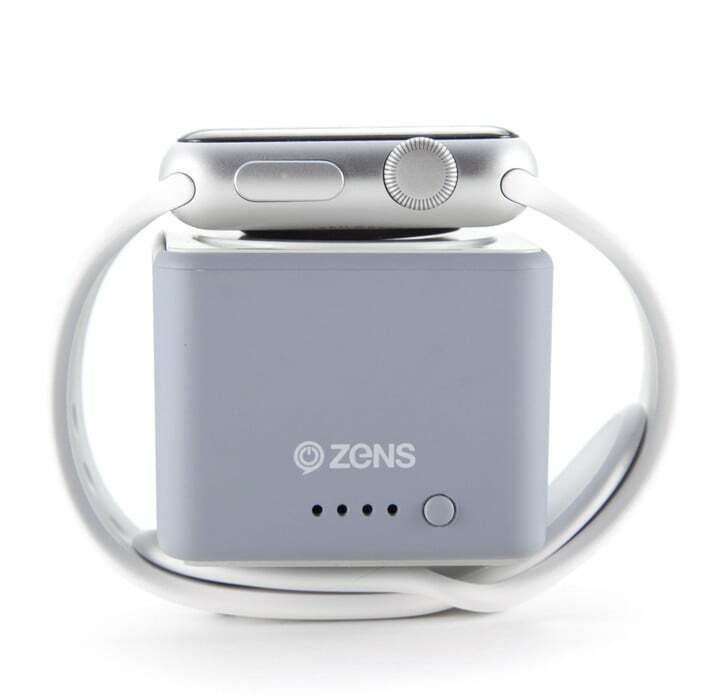 ZENS claims that you’re able to charge the Apple Watch up to three times on a single full charge of the Powerbank. I found the cube form factor to be incredible, as I can literally just stuff this in my pocket (and I wear girl jeans) and not even feel it. But to be on the safe side, I usually just throw the ZENS Powerbank into my Waterfield Designs Muzetto laptop bag to make sure I have some power for my Apple Watch, along with all of the other stuff I carry on a day-to-day basis. The soft-touch rubber material also feels fantastic and makes it easy to recognize where your power bank is. I took only the ZENS Apple Watch Powerbank on my trip to San Francisco last week for GDC, and it served me quite well for the three full days I was there. By the end of the day, my Apple Watch would be sitting at about 20 percent or so, and once it reaches that point, I like to charge it up to get ready for the next day. 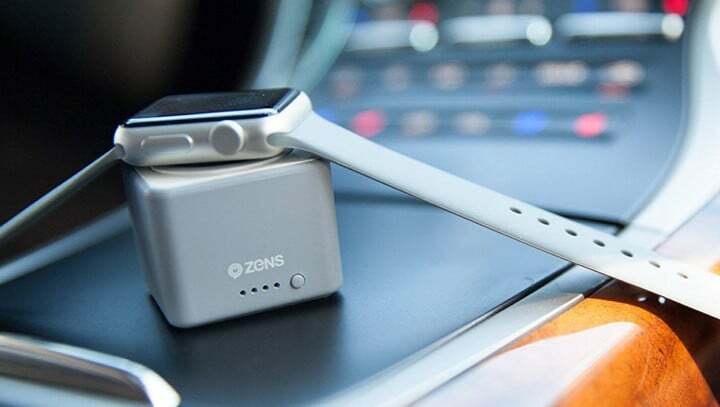 With the ZENS Powerbank, it would quickly charge up my Watch, getting it back to 100 percent in about an hour or so, and there would still be plenty of juice left for another charge the next day. I only topped off the ZENS battery once on my trip just to be safe, but I haven’t charged it since last week and it’s still going strong (four lights) as a backup battery if I need it. For those who are wondering about how long it takes to charge up the ZENS Powerbank, it’s not long at all. In fact, it should be fully charged within an hour and a half or so, at least from my experience so far. Another benefit to the ZENS Powerbank is the fact that it does support passthrough charging, so you can use it as a full-time charging station at home or the office, as well as on-the-go. Personally, I love having the ZENS Apple Watch Powerbank around as a portable battery solution for my Apple Watch. The cube shape makes it super easy to take with you anywhere, and the materials that it is made of are solid, so this battery pack has great build quality. It also holds enough juice to keep the Apple Watch charged for a few days without worry, and even if you run out of juice, the passthrough charging works wonders in a pinch. I like products that simplify things, and the ZENS Powerbank for Apple Watch is one of those products. The price tag may be a bit high for such a small accessory, but honestly I believe that such convenience is well worth the cost. 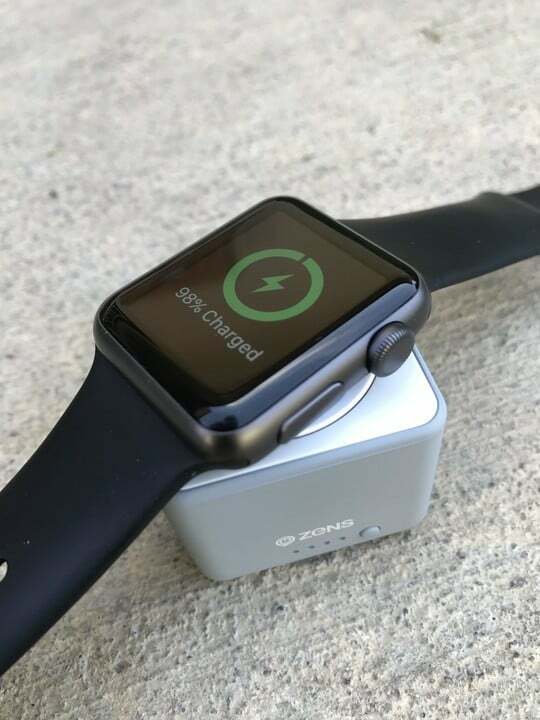 The ZENS Apple Watch Powerbank comes in white or gray and is $49.99. 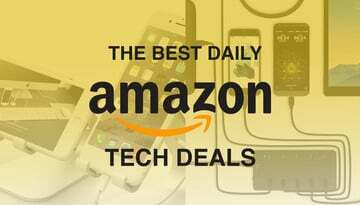 There is also a black Apple iPhone/Watch Powerbank hybrid for $69.99, if you are looking for an all-in-one solution for portable charging of your phone and watch at the same time.